We don’t care what time of day it is, it’s always a good time for a cookie. Whether it’s your classical choc chip (you can rarely go wrong) or something more adventurous, these will be sure to please even the most die-hard cookie fans. Grandparents are well known for their wisdom and Grandma's at Alexandria bakery shop is famous for their great combination of sweet and savoury homemade treats, inspired by grandmas worldwide. They offer a vast selection of delicious home-made cookies, all made with natural ingredients. 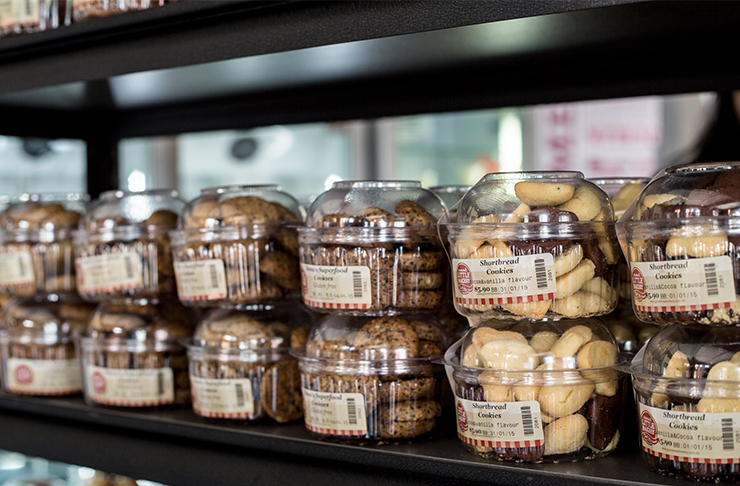 Our favourites in store are Grandma Haya’s pistachio and butter cookie, the traditional date cookie and Grandma's love shape vanilla and cocoa shortbread. If you’re after a gluten and dairy free option, their brand new Dana's Superfood cookie combines nuts, seeds and coconut that can help you stick to the healthier side. Plus, be sure to check out Grandma's Cookies Celebration this Saturday (November 29) for a jam-packed day of free kid's cookie baking classes, cookie tastings and Christmas specials prices. To find out more contact Grandma's on 02 9690 0069 or go to their website. Flour And Stone are famous for their baked goods and sweet, sweet cookies. Nadine Ingram bakes all the products with love and you can taste the care that’s been taken in each bite. From hand-iced gingerbread to gluten free apple and cinnamon to vegan choc chip, all your cookie needs will be satiated with a trip to Flour And Stone. If you have been searching for the perfect cookie your whole life you can officially look no further as soon as you get your paws on one of West Juliett’s famously delicious pink salt chocolate chip cookies. But get in quick, as there are only 150 of these baked daily and these saucer-sized babies sell fast. We also hear there is an ice cream sandwich arriving just in time for summer, so keep your eyes peeled! A well-known cult favourite is Luxe’s oat chocolate chip cookie. Although the addition of oats is a little non-traditional in the highly contested choc chip cookie world – it works for a nice chewy yet still chocolatey consistency. Been into Bourke Street Bakery but failed to see the cookies amongst the bread and pastry show stealers? Well, you have definitely been missing out. The signature chocolate and sour cherry cookies are worth a try – they definitely tick the boxes of crunchy yet fudgy and the addition of sour cherries makes an interesting and yummy combination. Nutella in a cookie? Yes, it does exist and it certainly does not disappoint. Redfern has its own cookie celebrity and his name is long – burnt butter, triple choc cookie with Nutella centre and sea salt. Don’t be put off by the complicated ingredients, just go with it and jump on the bandwagon (but get in quick, they sell out faster than you can say its name three times). Sometimes, simple is better. Cookies+Milk in Newtown have mastered the art of simple but delicious. All cookies are freshly baked, texture is paramount and there is attention to flavour layering. The classic cocoa nib cookie is a testament to minimalism and is sure to satisfy your cookie cravings. Kurtosh is a baked goods dreamland. Slabs of every flavoured cake imaginable, cookie and savoury treats line the glass cabinets of this amazing little bakery/café. It’s easy to get distracted by all the cake but keep your eye on the prize and get the choc fudge cookie. We promise you, you won’t be disappointed by this cookie sandwich filled with a rich chocolate ganache.